The â€œClient Management featureâ€ refers to the use of Person Accounts. A person account is used primarily in Business to Consumer (B2C) applications. Essentially it blends the functionality of both an account and a contact into a separate record type on the account object called a â€œPerson Accountâ€. As record types are involved, this is an Enterprise+ feature. It is free, but is enabled by request only. See â€œWhat is a Person Account?â€ and â€œPerson Account Behaviorsâ€ for more details. 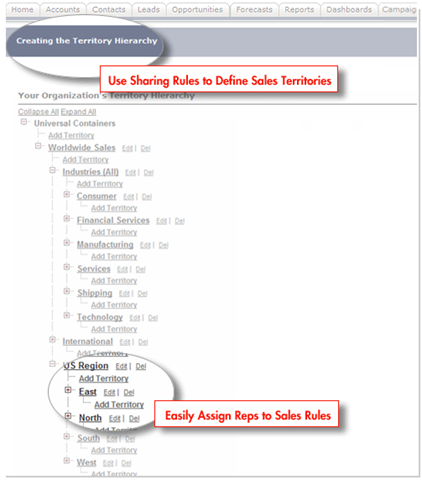 Territory management gives you the ability to structure your sales organization and grant access based on industry, state, or any other (including custom) field. In addition, multiple forecasts can be created per user per territory. Take the screen below. A sales rep may need to forecast into both the (US Region) â€œEastâ€ territory and the (Industry) â€œConsumerâ€ territory. Customizable forecasting must be enabled for the org. 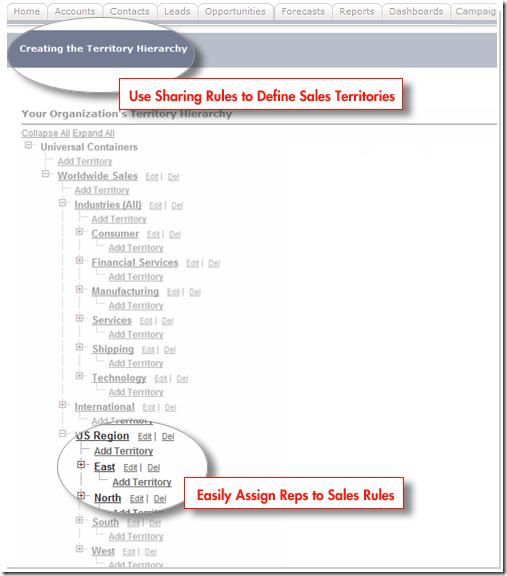 Territory management is free, but available by request only. This is an oversimplified explanation of territory management. At a minimum, I suggest reading â€œWhat is Territory Managementâ€, and â€œTerritory Management FAQâ€. Only certain fields and objects are impacted by Advanced Currency management. For those impacted, the applicable date field would determine which exchange rate is used (e.g. Close Date determines which rate is used for Amount on an Opportunity). For those fields not impacted (e.g. cross-object formulas), the static exchange rate is used. See â€œAbout Advanced Currency Managementâ€ for additional information.